MANILA, Philippines - LRT and MRT schedule have been released for December 24, 25, 31, 2014 (Christmas Holidays) and Jan 1, 2015 (New Year) operations. LRT/MRT Spokesperson Hernando Cabrera on his Twitter account announced LRT 1 and 2 and MRT3 train schedules. Cabrera said that on December 24 and December 31, the last train for MRT-3 which serves close to 540,000 passengers a day will leave North Avenue station at 8:30 p.m., and Taft Avenue station at 9:14 p.m. Meanwhile, on December 25 and January 1, the first train will leave North Avenue station at 6:30 a.m., and Taft Avenue station at 7:10 a.m. The last trains of the LRT 1 will leave Baclaran and Roosevelt stations at 8:00 p.m. on December 24, while the last trip would be at 7:00 p.m. on December 31. The LRT1 is the oldest mass transit system in Southeast Asia that runs from Baclaran in Parañaque City to Roosevelt Avenue in Quezon City. Cabrera also announced shortened operations for LRT2. The last train on December 24 leaves Santolan at 8:00 p.m. while the Recto train leaves at 8:30 p.m.
On December 31, the last trip from Santolan station is 7:00 p.m. and the last train from Recto leaves at 7:30 p.m. 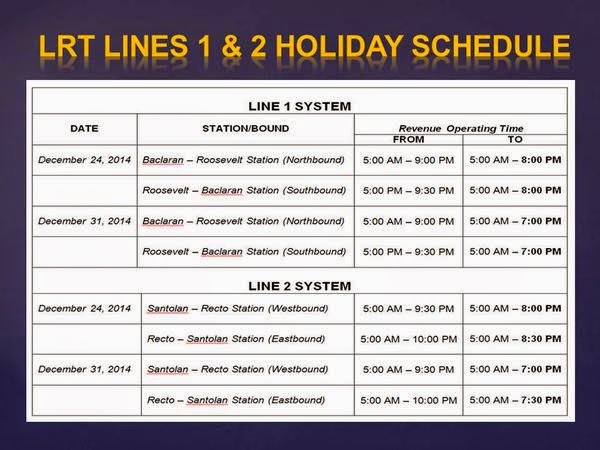 Here is the complete list for LRT Train Revenue Schedule for Dec 24, 2014 and Jan 1, 2015 as announced by Cabrera. The Metropolitan Manila Development Authority (MMDA) has lifted the number coding scheme from December 23, 2014 to January 4, 2015.